Let our master workers help you get everything in order, so you can have more free time and a better place to live in. We can clean both residential and commercial properties and if you choose us for your partner you will not regret it. For the last five years our specialists have gained a lot of knowledge and now they know how to deliver a professional cleaning service. The professionalism of our workers in combination with the flexibility of our prices is making our company an industry leader. The web server used by Cleanerssouthcroydonuk.co.uk is run by Dedicated Server Hosting and located in Great Britain. This web server runs a few other websites, mostly in the english language. 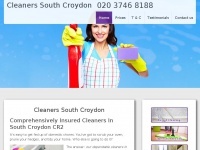 The websites of Cleanerssouthcroydonuk.co.uk are served by a Nginx server. The content management system WordPress in the version 4.5.3 is used. The HTML pages were created with the latest standard HTML 5. Due to the robot information on the webpage, the following actions by webcrawlers are not allowed: using the description of the website from the Open Directory project. All other actions by webcrawlers are allowed.